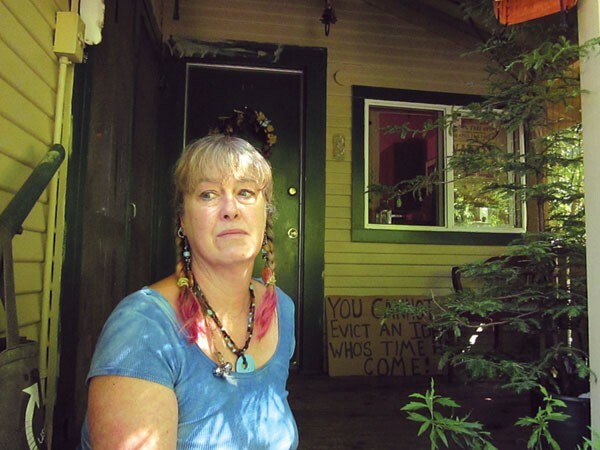 SHADY Deborah Kay says she has proof of 'robo-signed' loan documents for her Guerneville home. One year after a motorcycle accident left her with a traumatic brain injury, Celeste Singh received another blow when her house was put up for auction by mortgage servicer IndyMac in the midst of negotiations for a permanent loan modification. Singh prevented the sale by filing Chapter 13 bankruptcy, only one in a string of desperate actions going back to 2009, but the Forestville resident struggles to remain in her 1930s-era home near the Russian River. "There have been times that suicide was an option for me," says Singh. "Because would it be better to go live under a bridge?" The owner of a hair salon and a recent graduate of Santa Rosa Junior College, Singh says that she feels like a "sitting duck," just waiting for a 120-day notice of eviction to be pinned to her door. This past May, Singh testified before a joint legislative conference committee in support of the Homeowner Bill of Rights, an act of legislation developed by the office of Attorney General Kamala Harris. Before a panel, Singh relayed her story of taking out a "predatory" loan (in her words) with IndyMac Mortgage in 2006. Payments began at $800 a month but soon ballooned to over $2,400 a month, an amount that became untenable as Singh recuperated from the accident. Now, Singh is suing IndyMac and its owner OneWest Bank, and hopes that the case will allow her to stay in the home where she's lived and raised four sons—three are in the U.S. military—for over 10 years. In July, Singh's effort seemed to pay off when Gov. Brown approved and signed the Homeowner Bill of Rights. Considering that between 2008 and 2011, 1 million homes in California were lost to foreclosure—with an additional 700,000 facing imminent foreclosure—there seems to be no abatement to the foreclosure crisis. Effective Jan. 1, the bill aims to end the practice of dual tracking (where mortgage servicers advance the foreclosure process while still working with homeowners to secure loan modifications) and demands the provision for a single point of contact. The law will also impose fines on any servicer found recording or filing multiple unverified or forged documents (known as "robo-signing") and allows homeowners to sue for material violations in a court of law. Deborah Kay, who purchased her home in Guerneville in 2003, claims that dual tracking and a confusing maze of loan-modification terms have been the norm when dealing with Wells Fargo, her mortgage servicer. Wells Fargo currently controls one-third of all new U.S. mortgages, more than the seven next-largest lenders combined.